This time of year always brings out some good press for the Cowboys as the media usually looks back to profile Wyoming legend Kenny Sailors. 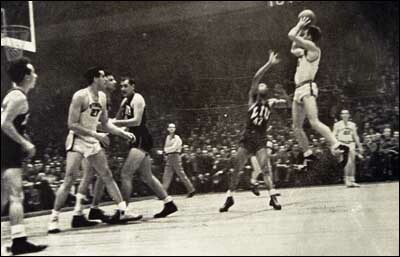 As most Wyoming fans know Sailors was the key player on the 1943 National Championship team and is considered the inventor of the modern jump shot. The Denver Post has a nice feature article by Anthony Cotton HERE. In other news, the Cowgirls defeated Nevada 74-53 in the first round of the NIT in Laramie on Friday. Next up for the Cowgirls is Texas Tech at the AA on Tuesday night. In wrestling Joe LeBlanc had a very strong showing placing 4th in his 184 lb class, earning him All-American honors. Congratulations Joe!! !